Many people were surprised by the recent NASA announcement that evidence was found for summertime water flows on Mars. Well, this is something that could change completely our perception regarding other planets. “Mars is not the dry, arid planet that we thought of in the past,” said Nasa’s Jim Green. I believe that marine litter science is a similar case - the findings that are already here and much more the ones that will come will change our perception for the plastics and they will create innovation waves that will reshape recycling and waste management. Well, maybe not so drastically as billionaire Elon Musk has spelled out that he wants to change Mars (he plans to create temporary suns over Mars in order to heat the Red Planet) but probably with a more concrete way. 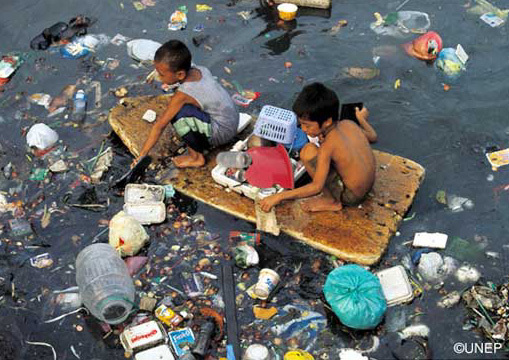 Marine litter will be a key-issue for waste management for the next 2-3 decades. The facts are shocking. According the recent study "Threat of plastic pollution toseabirds is global, pervasive, and increasing", 80 of 135 (59%) species with studies reported in the literature between 1962 and 2012 had ingested plastic, and, within those studies, on average 29% of individuals had plastic in their gut. 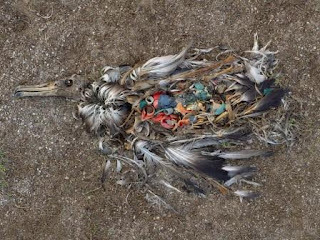 Currently, the annual losses of sea birds, turtles and fishes related to the plastic pollution are estimated to be more than 1.5 million deaths per year and according to Laurence Maurice from the French Institute of Research for Development, the problem is likely to worsen. Just imagine that we are speaking for concentrations that reach 580,000 pieces per km2 and the plastic production is increasing exponentially. So it is not a surprise at all, when it is forecasted that the increasing plastics ingestion in seabirds will reach 99% of all species by 2050! Together with climate change, marine litter and ocean garbage gyres prove that no matter if we understand it or no, local waste management practices create global impacts and that there is a need for global coordination in order to manage such global impacts. 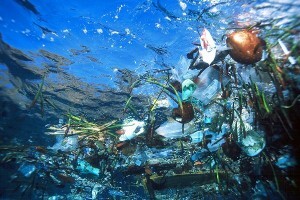 Marine litter is also a certain signal for the limits of our societies, the technological, social and ecological ones. Marine litter is straight forward associated with ecosystem’s damages by plastic pollution and demonstrates the tangible and measurable impacts of our collective inertia to face the global waste management challenge. I have gone through two recent research papers that demonstrate the long-term impacts related to plastic pollution and marine litter. The first one (Global warming releasesmicroplastic legacy frozen in Arctic Sea ice) indicates that microplastics have accumulated far from population centers and that polar sea ice represents a major historic global sink of man-made particulates. The study suggests “the potential for substantial quantities of legacy microplastic contamination to be released to the ocean as the ice melts therefore needs to be evaluated, as do the physical and toxicological effects of plastics on marine life”. Well, obviously the case of marine litter represents a huge global and local challenge for the international stakeholders, the governments and the industry. The solutions required have just started to be discussed publicly and some pilots have started to be tested. For sure, the solutions required will need changes in the whole life cycle of plastic products and not just in the way they are managed when they are considered as “waste”. But let’s focus on the other side of the moon. The case of marine litter highlights some new opportunities, as much as it reveals global long-term threats. I am not hoping for a megatsunami, like the one that 73,000 years ago was created by a large flank from the volcanic island Fogo in the Cape Verde islands, off the coast of Africa, that fell into the ocean and triggered a tsunami that moved mountains. Let’s start with the obvious. Marine litter impacts (much more than climate change) are relatively easily understood and visualized, so I bet that there will be many communication campaigns, especially the ones related to plastic recycling, that will use the case of marine litter as a powerful communication “bridge” too, for broad audiences. So, yes, what I mean is that marine litter opens the opportunity to influence much broader audiences and create global awareness about the waste management and the recycling challenge. The huge impacts of plastic pollution, which have just started to be understood through the case of marine litter, create the dynamics to discuss about the necessity to reduce plastics from the waste streams and to identify appropriate final treatment techniques when they can’t be recycled, for one or another reason. Even better, we have to use the case of marine litter to promote the discussion for a plastic waste – free society, where many products should be redesigned in order to reduce or eliminate plastics and substitute them with more ecologically friendly materials. Obviously, the big challenge is to create an appropriate systemic integration between supply chains - consumption and post consumption management of plastics and the emerging Internet of Everything with the possibility to develop digital passports is certainly a hope. I do hope that we will also have a lot of technical innovation related to the management of post-consumer plastics – some new patents have already attracted my attention like production of ethanol from single stream plastic recycling or preparation of high calorific value fuel from end of life plastics. But this is just the beginning, because the global magnitude of the problem has attracted the attention of the big donors that are pulling gradually a lot of money to the relevant research. Many local social innovation programs have also started and if they become mainstream, sooner or later the problem will become much more manageable than it is today. ...interstellar travel (without the Evil Empire)...climate change, "global warming is melting the poles, freshwater, and therefore...could stop deep sea currents...will increase evaporation (ebullioscopy: the less salt has, more evaporates) producing gigantic storm clouds that...phytoplankton shortage may decreasing its vital contribution with oxygen to the Atmosphere"... Warming...invasion of tropical diseases carried by their transmitter agents, already without the "general Winter" containing them, would faLL upon the World like a plague (dengue, malaria...)...can produce a cooling, a new ice age, like living at the North Pole...and less oxygen in the Atmosphere...is not known what will be worse. Go choosing. (And while, the Evil Empire: religion, armies, monarchies and politicians...looking elsewhere and instead of to prepare the STARS PEACE, that do not interesting them...they are already preparing the "Star Wars", of course, war in which as always they will remain in their golden palaces eating partridges and will command the innocent People...( "National Anthem", "Flag", "Honor", "Medals", "Veterans", "Patriots", "Heroes", "just to God praying and with the mallet striking"... The young went cheerfully drinking and singing in the rain patriotic songs, as if they were going to a party...carried them into cattle trains), again, to the deadly and muddy trenches gangrene in feet with their topboots on, during days and nights in the mud, to massacre them from enemy´s machine gun nests...with the story of "patriotism"...who survived to the inhuman artillery bombed were affected by violent tremors. All armies spied the letters of soldiers, if "people in the know" did not want climb the coarse wood stairs, because suddenly they did leave to be innocents and did know the truth: THE CAUSERS OF WARS ARE THE "LEADERS" TO DEFEND THEIR PARTICULARS RESERVED GREAT BUSINESS: NATIONS, WARS AND FRONTIERS, the "leaders" of all the World they are all friends and at same time enemies, People is the unique common enemy that they have..."attention! ", "a soldier do not think, a soldier obey! "...did shoot down to were called "cowards", "deserters", "that did not want fight for their country"...right over there at trenches. It is "our" economy...). AROUND THE WORLD EVERYBODY must to say...to the next war that going at trenches: pontifices, monarchs and politicians...and fight between them, then rapidly already NO MORE WARS OF AGGRESSION, and so do not will have neither justified wars of defense.